Blogging is one of the best ways to build customer relationships, and it can easily become the foundation of your sales strategy. Building and maintaining customer relationships is key when it comes to making sales. There’s that age-old saying: it costs five times more to gain a new customer than it does to keep an existing one. And in 2018 we’re seeing that people are increasingly attracted to companies and brands through personal recommendations. Not only will perfecting your customer relationships help keep people buying from you, but it’s also essential for attracting new customers. 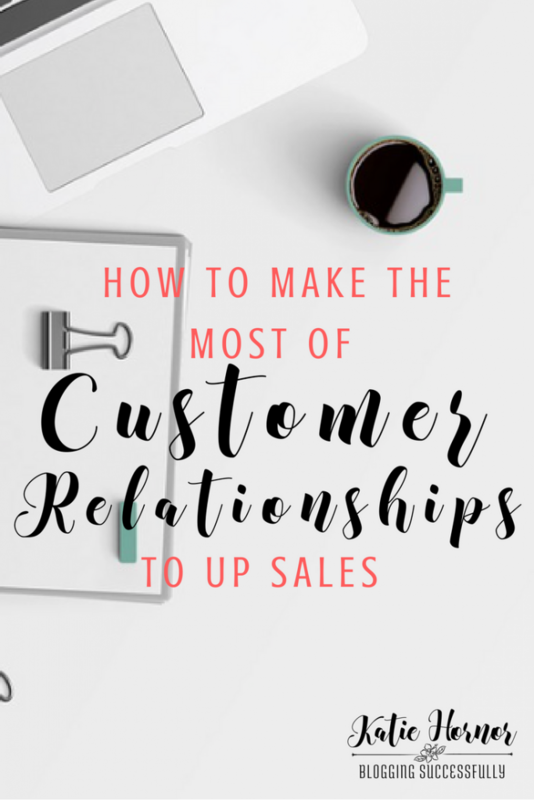 With this in mind, our guest author today, Victoria Greene, has compiled several top tips for making the most of customer relationships in order to increase your sales. The key to building great customer relationships is through consistent interactions. Create a compelling brand persona and be visible to your target audience. This is step #1 of building your own online tribe. Have an idea of the average person who buys from you, such as what they like and how old they are, and utilize this when talking to your customers. Everything you do, from banner ads to blog posts, needs to created with your target demographic in mind. Some potential clients and customers will be drawn to your company simply because they are interested in your niche. Make sure that you encourage discussion—this will help you to be seen as both a participant in the conversation, and a source of knowledge. One key way to do this is through creating a great newsletter where you share and curate relevant content. Sharing knowledge is a big part of relationship building. Can you create advocacy for a great cause? It doesn’t have to be anything super world-changing, but it does need to be relevant to your business. Whether it’s saying bye to boring corporate copy, or championing the right of moms to meaningful work, bringing people together over a shared passion or belief is a great way to make your business more relevant. Goat Milk Stuff make the most of their supporters by featuring community photos prominently on their homepage. It’s a great way to integrate social proof into your website and champion your customers, without having to resort to any ‘marketing speak’. The wholesome imagery and customer stories do the selling for you. When a person is considering buying from you, they are always asking: “what’s in it for me”? You need to offer more than just the bare minimum in order to keep people interested in the long term. Many ecommerce stores sign their customers up to a newsletter in which they offer exclusive deals — notifying customers of impending discounts and giving them early access to flash sales and pop up events. It’s a really easy and simple way to get your customers to start thinking about their relationship with you as a long-term thing. Content marketing is another great way to add value. Many people use content marketing mainly to rank better on search engines; however with the right material you can become recognized as a genuine thought-leader and source of inspiration. Give some of the ‘good stuff’ away for free as part of your content strategy, and people will come rely on you more and more. This can include things like webinars, podcasts, downloads etc. Think outside the box when it comes to content creation, and use your blog as a launch platform. Netflix provides a great service, but they also champion customer stories and talents. They show that they get their client base by sharing user-generated content. People love the recognition of being mentioned by such a big player, and it shows that Netflix are tuned into customer discussions. In this instagram post they are kind enough to tag a jewelry designer who made a Netflix necklace — a great shout out for a budding brand. Netflix also work hard to share all sorts of ‘insider’ references to their popular shows, including sneak peaks of sets and everyone’s favorite TV pets. From the smallest family owned business, to the largest international corporation, everyone can use social media to build customer relationships. The advent of social commerce means that people are getting more and more used to the idea of buying products on social media. It’s a great development for small businesses and bloggers who don’t always have the overheads to launch their own store or retail outlet, but still want to share some of their products or services with their audience. Just don’t get stuck in a ‘sell sell sell’ mentality and abandon the values of community management. Attract. You want to appear attractive as a company, meaning a good logo, cover photo, description, and a decent brand story shown through your posts. Be interesting and informative to make people want to follow you. Advise. Show that you are an expert at what you do, and you’ll encourage like-minded people and those who are interested in what you do to engage with you. Befriend. Respond to queries, share relevant posts and like other people’s content. You don’t want to appear like a brick wall—you want people to feel able to connect with you. Customer service is another important way to engage with your customers on social media. It’s increasingly where they will be coming to ask you questions. In fact: did you know that 53% of people between the ages of 18-35 use social media to ask customer service questions? It has quickly become a quick, easy and direct channel for your customers to connect with you. Use social media as a sales, support, and education channel to make the most of it, and use social media tools like Hootsuite or Later to help you succeed. Community management is a big part of building better relationships, so be ready to get stuck in. You need to stay on top of customer feedback and reviews and use them to increase your sales figures. Make sure you answer people’s questions promptly and help them where possible. This will help build a positive reputation for your brand. You don’t want any bad reviews — but the do sometimes happen. Don’t quash or delete negative comments—respond politely and take measures to address the situation calmly. It is vital that you are consistent. It may be worth considering implementing an official company policy on how to respond to complaints to make sure everything runs smoothly and efficiently. In order to get reviews, you have a number of great options to help you pull them into your site, whether that’s on product pages, landing pages, or right there on the home page. Yotpo is a market leader in the reviews space thanks to its AI-technology; it works especially well with online stores built on Shopify. You can also benefit from these free review plugins on WordPress that can help transform your website into a fount of customer knowledge. However you collect and display reviews, make sure that you’re using that data to inform your sales strategy. You should always carefully listen to reviews and take on any feedback. Positive reviews are the ideal value propositions for social ads, longer content pieces, and business presentations. You should treat everyone the same way and with the same respect, whether they are your trusted customer or not. It might be tempting to focus all your attention on the decision makers, the newer customers, or the big spenders. However it’s worth bearing in mind that word of mouth travels fast! Don’t drop the ball when it comes to treating everyone the same — it will be obvious if you are trust trying to push your own agenda. Be open to partnerships and collaborations, but don’t become too obsessed with pursuing them either. Some customer relationships can be slow burners when it comes to final sale, so be patient. When it comes to sales, you can aim for either a short term or long term gains. If you want your business to last, it’s better to build relationships, not just sales funnels. Think of customers as your friends—treat them well and they will treat you well in return. Modern day marketing requires patience, but if you’re friendly and consistent you will see results in the long run. Victoria Greene is a writer and brand consultant blogging for Victoriaecommerce.com. Here she helps people ‘hack their growth’ with sales tips. Big fan of social selling and content marketing through storytelling.